Considered by many the last major figure in the evolution of jazz, saxophonist and composer John Coltrane left an indelible mark, his influence evident in many musical genres and on the musicians who play it, not just contemporaneously but to this day. Ben Ratliff’s story of Coltrane is far less a biography of the man than, as its title suggests, a narrative about the saxophonist’s sound, the evolution of it and the jazz world’s reception of it. Tracing Coltrane’s history from his early days in R&B bands right up through his final, highly experimental period, the author reveals a keen sense of Coltrane's ever evolving sound. Ratliff goes well beyond adulation, getting at the artist’s music with a keen focus on critical life events and experiences as well as Coltrane’s many recordings, making this volume a model for music criticism. Coltrane, as we know, was mentored by Miles Davis, in whose band he played, and by Thelonious Monk, with whom he played for about a year before returning to Davis’s band. Miles particularly influenced the saxophonist’s development, setting the stage for a search that was unique in the history of jazz. Ratliff recognizes the significance of the famous Coltrane quartet with McCoy Tyner, Jimmy Garrison and Elvin Jones, a group whose sound dazzled the jazz world. But Coltrane, always moving ahead, started incorporating new elements to the music. He added saxophonist Eric Dolphy to the mix, then Rashied Ali, a second drummer. In time, he was bringing in more and more experimental players, not necessarily his peers, musicians such as Albert Ayler, Pharoah Sanders, and his second wife, Alice Coltrane. Coltrane (The Story of a Sound) represents a significant contribution to the written history of Jazz and to a better understanding of post-modern Jazz. Even musicians who have listened to the music of John Coltrane for many years gain from the book new insights into the man and his music, sending them back to the recordings for more listening. 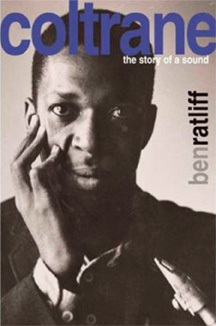 Ben Ratliff is an American journalist, music critic and author. Since 1996, he has written about pop music and jazz for the New York Times and published four books, among them John Coltrane (The Story of a Sound), finalist for the National Book Critics Circle Award.